2. Boil the potatoes until ‘al dente’ and cut into slices. 3. Slice the aubergine, courgette and sweet pepper. Dice the tomato. 1. For the white sauce: melt the soy butter and mix with the flour. Stir well with a wooden ladle until the roux is dry. 2. Pour the soy milk into the sauce little by little, while stirring with a whisk until it becomes a smooth, firm sauce. NB – you could also bind the soy milk with a white sauce binding agent. 3. Season with salt, pepper and nutmeg and boil for a few more minutes while stirring. 4. For the tomato sauce, fry the onions in heated olive oil until glazed. 5. Add the tofu or seitan and stew for another five minutes on a low heat. 6. Add oregano, garlic and tomato, bring to the boil while stirring, leave to simmer for 10 minutes. 7. 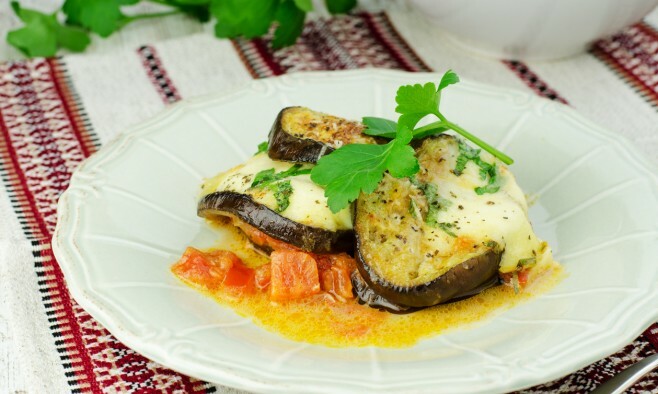 Place the aubergine, courgettes and the sweet pepper onto a greased oven dish and put into the oven. NB – you could also fry the vegetables on both sides in a pan with olive oil. Tofu is a meat replacement made of soy milk. It has a bland flavour but easily takes up the flavours of other foods. It is low in fat and rich in proteins. When cut it into cubes, tofu is easy to shallow fry, deep fry and grill. Seitan is a wheat gluten meat replacement. 1. Put a layer of vegetables into a lightly greased deep oven dish. Next, add a layer of potatoes and a layer of tomato sauce. 2. Finish with the white sauce. 3. Put the moussaka into the oven for another 15 minutes. Level 6: make sure the vegetables are well-cooked and crush or cut the vegetables separately. Cut finely. Level 5: crush the vegetables and the potatoes separately, add vegetable stock if required. Level 4 and 3: mix and sieve the vegetables and potatoes separately until fine. Add vegetable stock until the required consistency is reached.